There’s a Leek in the Pot! If you like vegetable puns, then today’s your leeky day. What does a leek look like? Well, let’s be real. I thought a leek was a scallion. And a scallion was a chive. And a chive…was kind of useless. The other day, my good friend caught me staring at a leek. I was dazed and confused as to what it was and how I could use it. She didn’t have to tell me about its moleekular biological structure, she just said “it’s bigger and fatter than a scallion.” That seemed to do the trick. Leek at me now. I have entered the world of the Allium Porrum and I can’t go back. In fact, I’d say that I’ve improved my vegetable game by leeks and bounds. If you don’t have a good friend to give you such a marvelous description, click here. So…what’s a chive? Click here. And while we’re being real, let me tell you that I found this recipe by simply Googling “Potato Leek Soup Recipe” and up came Simply Recipes’ delightful creation (@simplyrecipes). While I changed a few ingredients, mostly because I didn’t know what marjoram was and didn’t put in the effort to find out, I must still give all due credit to Simply Recipes for this hearty soup’s crafty composition. What changes, you might ask? Like I said, I didn’t know what marjoram was (this may be a future blog post, leek for it later) and certainly didn’t have enough thyme and time at my disposal. I used vegetable broth instead of chicken broth (I served this soup to vegetarian friends) and used Sriracha sauce instead of Tabasco. I didn’t use Sriracha JUST to be a hipster, but also because my friends didn’t have Tabasco. They had three different types of Sriracha. Saucy. What about that Crisco though…why in the world did you use Crisco? It sounds like you took a bunch of bacon, burnt it, put it outside in 100 degree weather, and then crunched it. Simple answer. I didn’t have any butter. And I’ve never used Crisco and thought HEY THIS IS MY CHANCE TO USE CRISCO. It also sounds like “Frisco,” the incorrect way to refer to San Francisco, as many non-San Franciscans will do. And without further ado…here’s the recipe! A leek of its own: cut off the dark green tops and the bulbous ends of the leeks. Then cut the leeks lengthwise, fan them, and place them under running water to get rid of dirt that could be trapped inside. Slice the white and light green parts of the leeks crosswise into 1/4-inch thick slices. Still confused? I was. Leek at this nicely done how-to-video by Ruth Cousineau to get a better idea. Cooking with Crisco: melt Crisco on medium heat in a 3 to 4 quart Leeky Cauldren (a.k.a. pot). Add the leeks and stir with the Crisco. Cover the pot and set the heat to low. Cook for 10 minutes until the leeks are softened. *Note: Make sure the leeks aren’t browning. The Leeky Cauldren: add vegetable broth, potatoes, bay leaves, and a teaspoon of salt to the pot. If you’re me, you misread the Simply Recipes’ recipe and thought that parsley was an herb and added it to the pot at this time. You can make my mistake again or add it as the last step. Your choice. Increase the heat to high to bring the pot to a simmer, then lower the heat back down to keep your soup at a simmer. Cook for 20 minutes or until the potatoes are cooked through. Mixed reviews: remove and discard the bay leaves. If you like your soup chunky, then ignore this next step. If you like your soup smooth, pay attention. While the original recipe called for an immersion blender or standing blender, I used a less fancy blender. The ones you make smoothies with. Take a leek for yourself. *Note: I made half of my soup chunky and half of my soup smooth in order to appease the entire household. Addition and subtraction: *add the parsley (this is the correct time to do so) and cook a few more minutes. Add a few squirts of Sriracha to taste. Add freshly ground pepper and more salt to taste. I had to add lots more salt, so be equipped with a shaker. Well, I put my soup in a bowl. BUT. If you want to make it more home-style, put it in a mug. Seriously. Soup in a mug is ten times better. Want some more vegetable puns??? Are you sure?? Click here. 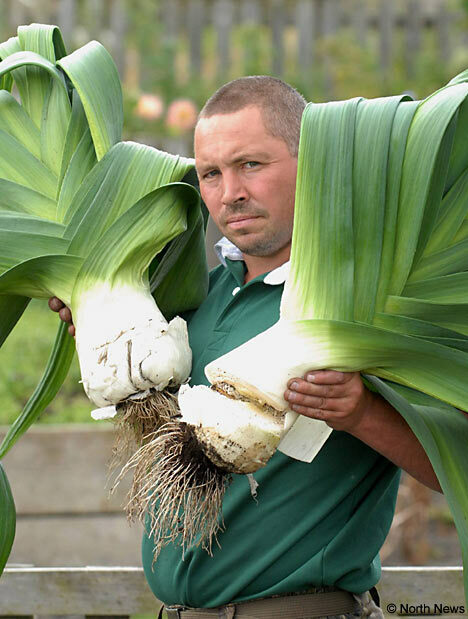 Want to see a REALLY BIG LEEK? Clicky clicky. Want to see a REALLY BAD LEAK? Click clickity click click. Next Post Hey There, Honey Cakes!